Jess Sancataldo drives to the basket. The freshman guard dropped 20 points in only 13 minutes. With junior center Abi Scheid injured, Northwestern could have been in trouble without one of its top scorers. Instead, one of the Wildcats’ newcomers stepped up in a big way. 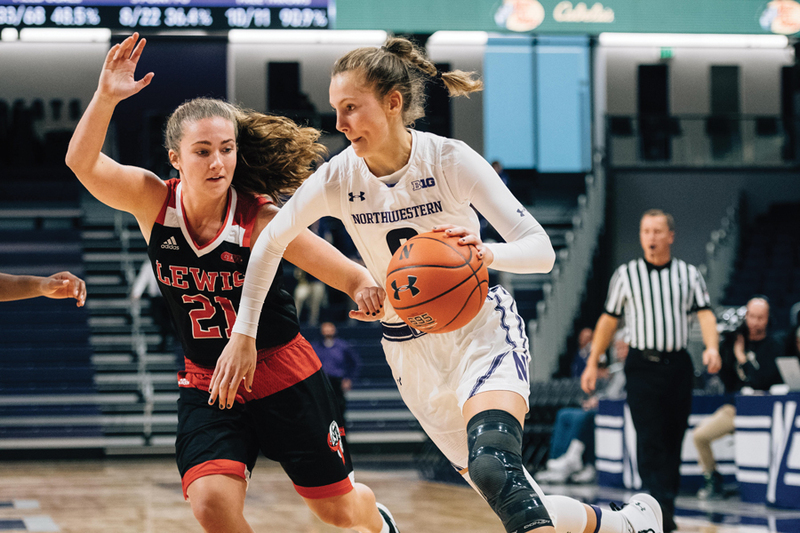 NU (5-0) blew out visiting Tennessee-Martin on Sunday, getting 20 points off the bench from freshman guard Jess Sancataldo and pulling away for a 90-64 win. The Sydney native was 8-of-10 from the field and made both of the Cats’ 3-pointers. Her statline is even more remarkable considering she only played 13 minutes. Sancataldo hinted at what she is capable of on Nov. 15 against Illinois-Chicago, scoring 10 points in seven minutes and making a pair of 3-pointers. On Sunday, she made an even bigger impression. Sancataldo has scored 32 points this season in just 23 minutes and has made 11 of her 13 shots. Coach Joe McKeown said Sancataldo was confused upon being told she had to speak with the media after the game. Being interviewed more is one of several adjustments she has had to make now that she is playing in a different country and at a higher level. The 6-foot sharpshooter was a versatile athlete growing up, competing in handball, cross-country, javelin, field hockey and track and field. She was a national champion in European handball competing for the Australian under-21 national team. In basketball, Sancataldo was a four-year varsity-team captain, averaging 24 points per game as a junior. McKeown said she is adjusting quickly to playing in the U.S. and to NU’s team philosophy. Sancataldo scored 16 of her points in the fourth quarter, including 12 in the last five minutes. The game was already out of reach by then, and UT-Martin (4-2), despite its solid record, is not exactly a powerhouse, but Sancataldo has nonetheless proven her ability to impact a game quickly. Her scoring prowess will be needed if Scheid misses significant time. Scheid had scored at least 16 points in each of her last three games and entered this season as a 36 percent shooter from beyond the arc. As a team, the Cats are shooting just 31 percent on 3-pointers so far this year, with Scheid and sophomore guard Jordan Hamilton being the only real threats to score from deep. Sancataldo made a case for more regular playing time with her performance Sunday, and her shooting ability makes NU more multidimensional and gives opponents more elements to defend.